The Seattle City Council has unanimously passed a scaled-down version of the tax on mega-companies that caused Amazon to suspend its construction in the city earlier this month. It now seems like Amazon was bluffing when it threatened to pull out if the measure went through, as pre-construction work on the 17-story Block 18 tower is reportedly back on. Seattle is weathering an affordability crisis as rents and homelessness rates continue to rise, and a tax on companies grossing $20 million a year or more was proposed as a way of funding new affordable housing. The proposed tax would have originally hit those larger companies (about three percent of businesses in Seattle) with an annual, $500-a-head charge. After deliberations between the Council, Mayor’s office, and the business community, a leaner, $275-per-employee bill that sunsets in five years was eventually passed. The original measure was expected to bring in around $75 to $86 million a year for the city, which would have built approximately 1,700 affordable units over the next five years; as passed, Seattle will reap $45 to $49 million a year, and only build out 591 units over that same period. Still, even these changes haven’t appeared to sit well with Amazon. 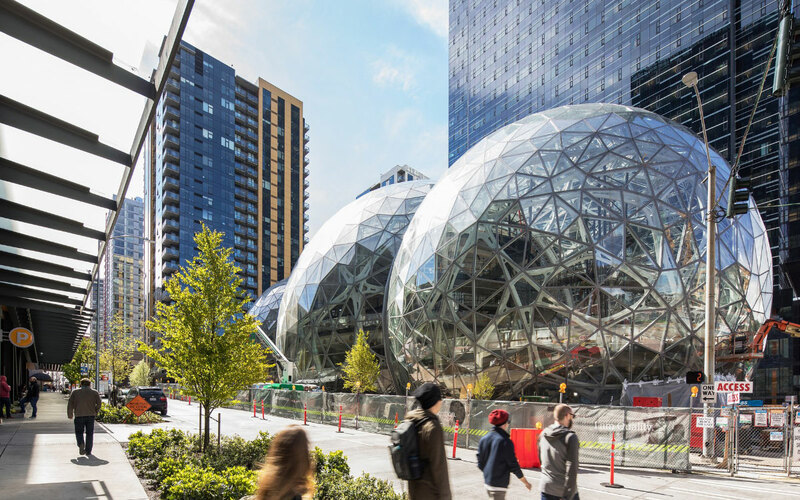 Although construction will move forward on Block 18, an office tower in downtown Seattle that could hold 7,000 Amazon employees, Amazon issued a sternly-worded statement after the vote threatening to reduce its footprint in the city. With 45,000 employees currently in Seattle, the tech giant would have ended up paying around $12 million a year. Amazon’s statement isn’t just bluster. While the Graphite Design Group–designed Block 18 will rise after all, the company is still debating about whether it will take the 722,000-square-feet of office space it was going to lease in the forthcoming Rainer Square building. As the HQ2 search continues, it remains to be seen whether Seattle’s pushback against Amazon will have an effect on what prospective cities are willing to concede; 40 officials from cities all over the country, including some of those still in the HQ2 running, have signed an open letter throwing their weight behind Seattle in this tax fight.